He has perfected his style in over 85 classes, including Math class, English class, & Science class, just to name a few. His teachers appreciated his artwork so much that they put him in detention, where he perfected his skills even more. In 9th grade he started drawing caricatures at Six Flags Astroworld in Houston TX, when his mother forced him to get a summer job. “Thanks mom!” There he was trained by Cecil Roberts to draw profile caricatures using calligraphy pens. After 2 years he opened a caricature booth on the Kemah Boardwalk in TX, then another at a local mall. 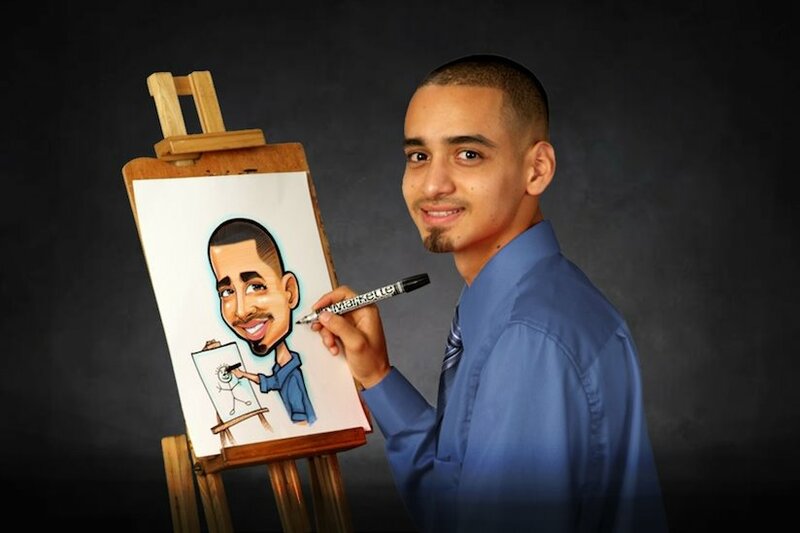 He now does custom & event caricatures on a full time basis & is a member of the ISCA (International Society of Caricature Artists). He has been excited about using the talent God has given him to make people smile ever since. Mac has performed at all types of events, from cruise ships to backyard birthday parties & from daycares to retirement centers. He is comfortable with all age groups & has excellent people skills. He is also a certified Forensic Artist from Nothwestern in Chicago & can draw criminals from eye witnesses (if you want a free sketch, get in trouble). He hopes to pick that up again when he retires from caricatures. A few of his inspirations include J. Leal, Mort Drucker, Tom Richmond and Sean Gardner.